The HTC smart phones built on Android Operation System beat most mobile phones in market. It is hard not to love watching videos on the impressive HTC phone. However, the video formats supported by HTC Smartphone only include: MP4, 3GP, WMV, ASF, 3G2, M4V, AVI (generally MP4 is preferable with better picture quality). Obvious enough, if you want to play new releases on DVD on it, you will need to use DVD to HTC ripper. Such program is a tool that converts DVD to HTC-friendly format so that the DVD movies could be playable on your for HTC phone. 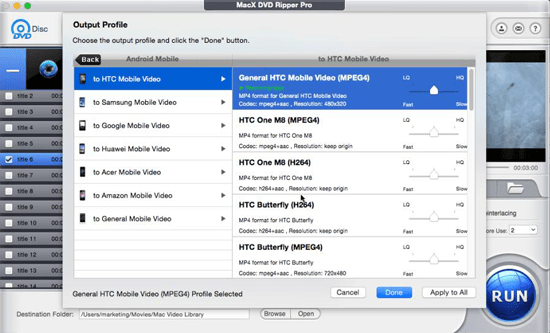 When you have a file of DVDs and would rather enjoy them on your HTC phone, MacX DVD Ripper Pro is among the best DVD ripper on Mac for you to convert and rip DVD to Android HTC and other phones, like the most sought-after HTC One M 10/9, HTC One, HTC One X, HTC Dream, HTC Sensation, HTC Evo, HTC Wildfire S, HTC Desire, etc. What makes this DVD ripper for Mac a great app to consider is how easy it is to rip DVD to HTC on Mac. Those people who are new to this type of software will be pleased to see just how easy it is to use to convert their purchased DVDs to Android HTC friendly format for convenient playback. With this Mac DVD ripping software, you could also easily edit the video: trim, crop and video customization. Free download the HQ DVD ripper for HTC and rip DVD to HTC phones, tablets, like HTC One M10/9 and more Android iOS mobile devcies. How to Rip DVD to Android HTC Phone on Mac with MacX DVD Ripper Pro? Before you rip DVD to HTC, you only need to take few minutes to Download MacX DVD Ripper Pro to you Mac. After you download and install this Mac DVD ripper, click "DVD Disc"; to add DVD from DVD drive. Or you can click "DVD Folder" or "DVD ISO" to import top 2019 movies or 2019 DVD movies from DVD folder saved on your computer. Select the output format as you want, since you need to rip DVD to HTC phone, here you just need to choose "to HTC Mobile Video". Choose the proper profile setting for the converted video for your phone like HTC One, HTC One MaX, etc. After you finish all the steps above, click "RUN" to begin to rip DVD to Android HTC One M10/M8 on Mac. You can view the conversion progress and are able to cancel the converting process at anytime. The Mac DVD ripper works as an flexible all-in-one Mac DVD ripper to convert DVD or rip DVD to YouTube or rip DVD to AVI, MP4, MOV, MPEG, H.264, iPhone, iPad, iPod, PSP, Xbox, Zune, Samsung, PS4, best tablets, phones. To play the ripped DVD video on iPhone iPad iPod, you can use MacX MediaTrans to transfer the converted DVD video from Mac/PC to iDevices for enjoying at any time. Expect to watch DVD movies on the mobile phone on the move? This tutorial will show you how to rip DVD to mobile so that you can enjoy DVD on iPhone, Samsung, Huawei and more on the Go. Notice: We only advocate using this best DVD ripper to rip commercial DVDs to HTC under the concept of Fair Use and do not encourage any illegal reproduction or distribution of copyrighted content. Please abide by the local DVD copyright law before doing it.